@Bobette wrote: Watching episode 2 now. Alex is glad she met Richie and in my head that translates to "you were my free ticket to 'fame'". She contradicts herself, saying he was coming to Melbourne and then saying he wasn't in the next sentence. Uggh yeah I think they are definitely talking about what has been speculated. Very tasteless of Alex to bring that up IMO especially as it seems like a blatant attempt to garner public sympathy/attention. What has been speculated that is all over the media about something no woman should have to go through alone? The only thing I can think of is termination of a pregnancy. The kettle is on - I'm about to watch episode 3. GIMME JULES! Mean girl Cat can't understand why no one likes mean girls. Duh. "I don't understand why guys wouldn't want a girl who's confident and funny..." she sobs. Well they do, but confident/funny doesn't equal mean/bitchy. You can be confident without being arrogant and funny without it being at someone else's expense. Rachel stays over Vanessa which is a shame because I think V makes for better TV but gotta keep Richie's harem well stocked I suppose. Bit rude IMO how everyone's so shocked/outraged outraged that Brittany stayed over Cat. Poor Brittany is practically apologising for being there! Rachel and Bill walk on the beach and she asks what his favourite food is as if they're 12. If that's her idea of flirting it's no wonder she's still single. Jimmy and Alienation go paddle boarding. I think we had pap shots of this date so hopefully that's the end of it and Jimmy will be spared later on. Ugh the double date is painful. Rachel sulks again. She's really irritating me - I can't stand whiny women. Paddy and Alicia break up. Davey arrives. JULES! The moustache flashback montage is HILARIOUS! He's like a hyperactive puppy who just wants to be loved. Adorable. Ugggh more of Alex and Bill. I could not be less interested. Shannon and Connor kiss and get twinkly music. People familiar with Connor - do you think they're a good match? Alex is waffling about Bill again and rating his kissing technique. Uggh I just cannot stand her. Oh god now Rachel's whingeing again. ETA: Alexnation autocorrected to Alienation but it's kind of apt so I'm leaving it. Brooke is overwhelmed because so many people want her. USAlex arrives and starts doing backflips for no reason. Cass fans herself and Brooke promptly cheers up. Alicia and Davey go on a date. 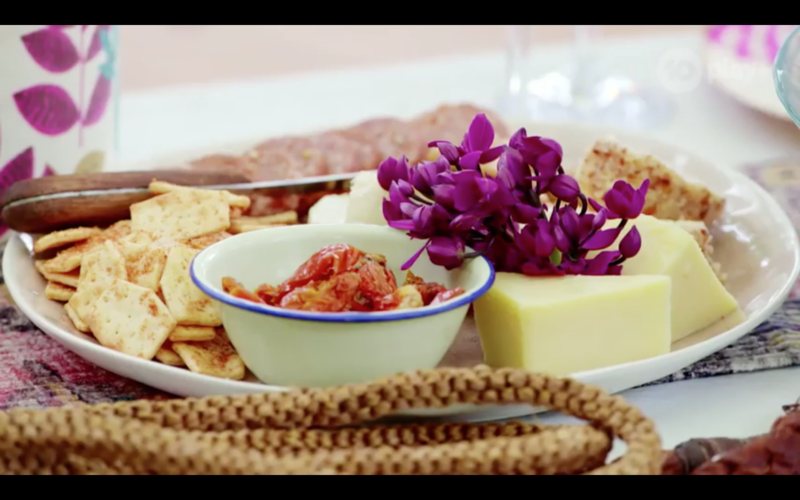 THE CHEESE PLATTER GETS A CLOSEUP! I hope they didn't dare try to eat any; the set dresser would have slapped their hand away. And here we have my new avatar. Each season one screenshot speaks to me on a deep and personal level and Jules sipping a cocktail while riding an inflatable peacock is perfection. Alex and Brooke fulfill their contractual obligations by going on a date and making out. Alex grabs Brooke's azz on the way out like she's a side of beef and I can't help but imagine all the outraged comments we'd get if a man did that. I still maintain Brooke is WAY more into USAlex (she's literally sitting between his legs when Alex calls her away) and this whole dalliance is scripted. Reminds me of girls who go to nightclubs and make out with each other just to turn men on. I don't dislike Alex Nation as much as most, but she's getting way too much screentime, it's getting boring. That Alex and Brooke storyline annoys me, so fake. I actually like crazy Brittney, she brings some light relief. I just binge watched as well. I didn’t see Ali or Nick’s season so there are only a few recognizable peeps for me. The cast and edit are often comedic. IMO many shamelessly play a character so it feels like a rom com with multiple plot lines. It’s a fun watch.